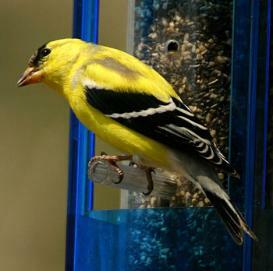 Nothing cheers up a day like a goldfinch. goldfinches in the dead of summer. the place, but even the butterflies seemed to be hiding from the heat. on sunflowers in other people's gardens. thistle seeds are a good, inexpensive alternative. evening are not likely the same ones you saw in the morning. regain their bright yellow plumage. Only the males are bright yellow. Mother Nature likes her colors.